"Music Theory Exam Games - Makes Learning Fun"
We all know Music Theory Exam Games are a fun way to reinforce concepts. Did you know that when you combine playing Music Theory Exam Games with completing Practice Exams, you can almost guarantee a successful Written Examination? Here is why! Remember that playing games improves learning! Playing Music Theory Exam Games improves learning the specific concepts needed for Theory Examination and it definitely makes learning more fun. 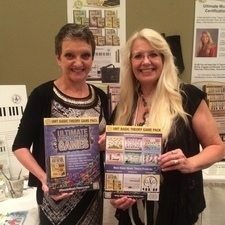 Joanne Barker, our Ultimate Music Theory Games Creator, worked with the concepts in each Workbook (and the corresponding Exam Books) in order to create games that would allow students to review those tricky concepts in a different context = the context of having fun! I talked about the importance of Concept + Context in my Blog "Playing Games Improves Learning". However, I don't just wait until students are preparing for their Theory Exams before I start playing Music Theory Exam Games! Have you had a chance to check out our UMT Basic Theory Game Pack and our brand new UMT Prep Theory Game Pack yet? The feedback that we have received from Teachers is outstanding! It is so easy to improve learning at the lesson using these games. 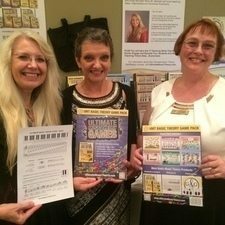 Here is a little secret - I use my Prep Theory Game Pack and my Basic Theory Game Pack with all my students - even those that are not yet in the Prep 2 Theory Workbook or the Basic Theory Workbook! My students (especially my hyper little ones who require lots of positive motivation) can earn Game Time at the end of the lesson. I can easily find a game that will fit their learning level - after all, there are instructions for over 36 ways to play the games in each Game Pack. The Ultimate Music Theory Exam Series covers every concept that could be presented on a Royal Conservatory of Music Theory Examination - from Preparatory to Advanced! 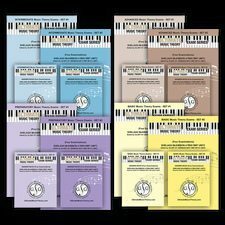 The Ultimate Music Theory Preparatory Exam Series is also the only Exam Series with Answer Books that you can purchase to prepare your students for the RCM Preparatory Theory Examination. Music Theory Exam Games combined with Practice Examinations will prepare your Student to complete their Theory Examination with ease, confidence and pride! And you are giving your students the foundation for success. Theory Games + Practice Exams = Success!